They even act like themselves in the poster! Dunno if many people bother going to the video shop anymore, I know my two local stores both closed and the nearest store that is any good is now 10 ks away. Anyway the weekly trip to the shop used to be how I managed to watch about 1,353,286 movies since the 90s. However this year I have only made about 3 visits to the store, instead watching stuff in the cinema, rewatching my own stuff or borrowing from friends. Only now I have watched most of mine and rifled through everything that my mates own. So this week I will be heading to the shop for an armful of weeklies. Before that I went to the cinema to check the new Harold Ramis flick Year One, I know it has copped a bake by reviewers as being horrible but Ramis is the guy that made Groundhog Day and Ghostbusters, I thought I’d give him the benefit of the doubt, (rather than watch my wife’s suggestion The Proposal). My verdict is that this is exactly the type of film that would usually end up in my arms at the video shop midwinter, when you couldn’t head outside during the day and couldn’t be bothered going out at night. Year One is lightweight, hardly memorable and not even very interesting, but dammit it was amusing and likeable. I would rather kill 80 minutes watching this than 3 hours watching Transformers 2, regardless of the appeal of Megan Fox in a tank top, and I would rather watch this again on DVD than watch 40 minutes of carefully plotted and scripted “reality” TV. As mentioned Year One has a pretty crappy storyline, almost as if the writers thought let’s make a comedy set in ancient times, and decided to rest on their laurels. 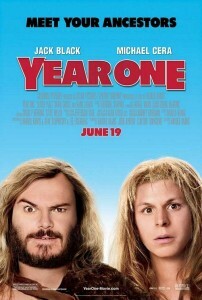 In fact 99% of the chuckles come not from jokes but from Jack Black and Michael Cera, both of whom play themselves. That means JB is energetic, manic and needlessly loud, and Cera is understated, meek and speaks under his breath half the time. If you thought Black was OK in School of Rock or Cera was funny in Superbad there might be enough for you here, but if you are expecting carefully plotted humour and hilarious setpieces look elsewhere, as Year One has absolutely none of that. The plot makes no sense, but that is simply because it means nothing to the film anyway. Black and Cera play Z and O, a couple of what appear to be “caveman” era guys, they spend their days hunting, gathering and trying to impress the cavechickies. Anyway Z and O run into Cain, Abel and end up in the city of Sodom for the second half of the film spending time as slaves. This is largely irrelevant, they learn nothing, achieve little until the very end and just sort of drift through various situations with no real impact. There wasn’t one scene that I would say was memorable in any way, aside from an upside down O relieving himself and having it run down his face, which despite the stupidity was actually pretty funny. Now that I’ve gotten this far in the review I see why most critics are almost unanimous in their derision of the film, but I still thought it was amusing due to the two leads and I actually could find myself watching it again down the line. Year One is harmless in the same vein as countless lightweight comedies of the 80s and 90s, stuff like My Blue Heaven, Men At Work, Three Fugitives and Turner and Hooch. You know, when a comedy was supposed to make you feel good after watching it, not leave you wondering if Little Freddie managed to pick up the venereal disease he so coveted. There’s not much reason to celebrate this movie, but I shut off my brain and I had a good time watching it. Final Rating – 6.5 / 10. Brainless, pointless, badly written and actually poorly made, I liked it anyway.